Thought to be the first tourist hotel in all of the Caribbean, the opulent Bath Hotel was built on Nevis in 1787 to provide visitors easy access to the on-site volcanic hot springs. 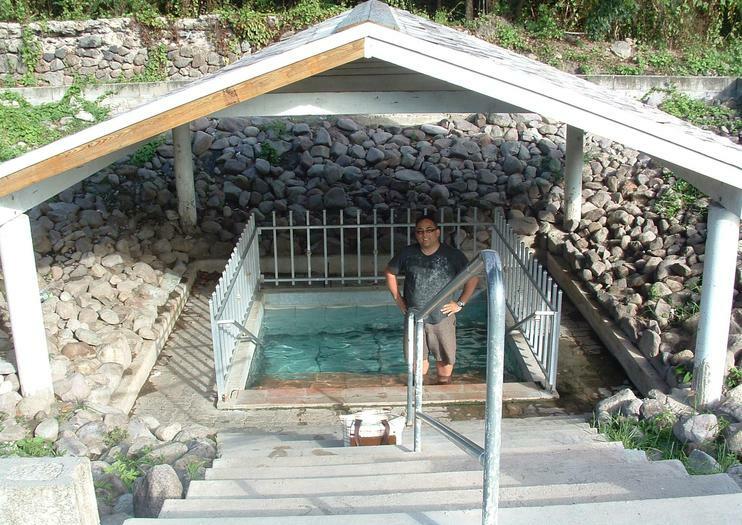 The mineral laden waters from the Bath Stream were believed to have healing properties, and the water temperature consistently stays around 107 degrees thanks to underground volcanic activity. Over the centuries, the hotel and the original spring house have experienced cycles of disrepair and restoration—today the hotel is partially used as government offices—but visitors can still take to the waters in the stream itself or in a bathing pool on the grounds. After a soak, take time to explore the once immaculately manicured property, home to the “Garden of Jericho,” where Captain Horatio Nelson’s wedding was held in 1787. To reach the Bath Hotel, drive south from Charlestown on Main Street and take a left after crossing the Bath Stream. The original Bath Hotel and Spring House are not open, but at the base of the hotel you’ll find a newly constructed, small bathing pool that is free and open to the public. Tour St. Kitts and Nevis aboard a power catamaran during this 5-hour excursion from Basseterre. On Nevis, get a comprehensive island tour including stops at the Nisbet Plantation and Pinney's Beach for lunch and some beach time. Use of beach chair and umbrella included, as well as pickup and drop-off from the St. Kitts port or the Marriott hotel. Ride a bicycle through historic Charlestown, the capital of Nevis, during this 2-hour guided tour. Visit the Nelson and Hamilton Museums, the birthplace of one of the US founding fathers Alexander Hamilton. Visit the Jewish cemetery and synagogue, the Bath Hotel and Springs. Pause for photo opportunities, rest stops and refreshments along the way and enjoy informative commentary from your local guide. Use of bicycle and helmet are included.